We could talk about generals we expect to push prices up today. We absolutely could do that. In fact, I think I’m pretty much supposed to since that was kind of what this series was predicated on. But I’m the Captain of this here vessel and today I think there are more interesting implications of Commander 2016 and there is a card that is a non-general that has a ton of impact on a lot of prices. I also think the card was a mistake to print and I think it was a mistake for it to presell for so cheap. I think it was a mistake to put it in the deck people are already going to buy overwhelmingly because it has the best 4-color commander and it doesn’t have red, red being the 6th best color in EDH. 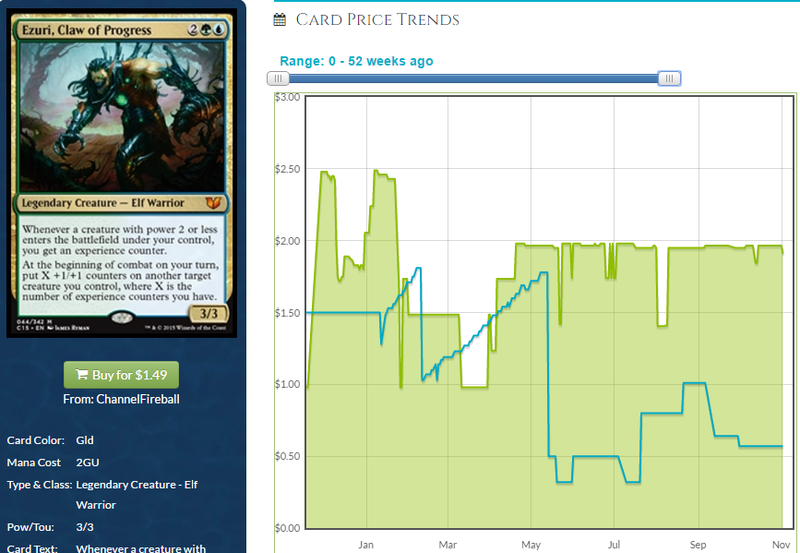 Let’s talk about how a non-mythic rare creature with terrible stats is going to impact more prices than most of the commanders and how this is the first of two mistakes in the set. I can go ahead and spoil next week’s article now – the other mistake in my estimation is Kydele, Chosen of Kruphix which just made everyone roll their eyes and say “Yet another broken Simic card” which is hard to argue with. I’m embarrassed as a Simic enthusiast just because Simic has become the New England Patriots of EDH and it would almost feel good to root against it just because I’m sick of seeing it get so much handed to it. If Golgari weren’t being equally rewarded merely for existing I would feel really bad about being super excited every time Simic gets a ridiculous new card that may or may not need to be banned later. Kydele is not ban-worthy but it will certainly dissuade a lot of people from pairing their partner commander with anyone who isn’t her for fear of doing it wrong. More on that next week. This week we’re focusing on a card I’m sure you’ve all already guessed. If you didn’t guess, you probably saw the image of the card in your periphery while you were reading the last paragraph. You know what? I’m actually going to do something about that to preserve the element of surprise. Act surprised. I was sure as hell surprised when they made this card and thought “This is probably fine, right?” and Star City said “This should probably be a $2 pre-order, right?” This card sold out at nearly every price point it was restocked at and while there’s no longer money to be made pre-ordering this, obviously, I think this makes us all some money. At the risk of pointing out a lot of cards I already pointed out when they spoiled Ezuri, there’s money to be made, potentially on cards we already made money on because of Ezuri. Also, Ezuri probably goes up. This is up $1 from a year ago and appears to have plateaued and HERE IS WHY THAT IS SUPER MISLEADING. Things are different, now. First of all, this is a second spike. You know, the one I’m predicting. OK, should this spike it will have been a second spike. That means a lot of loose copies and event deck copies have been pulled out of dollar bins and binders meaning copies are more concentrated in the hands of dealers. Renewed interested in this card forces people to get copies from places that others can track. 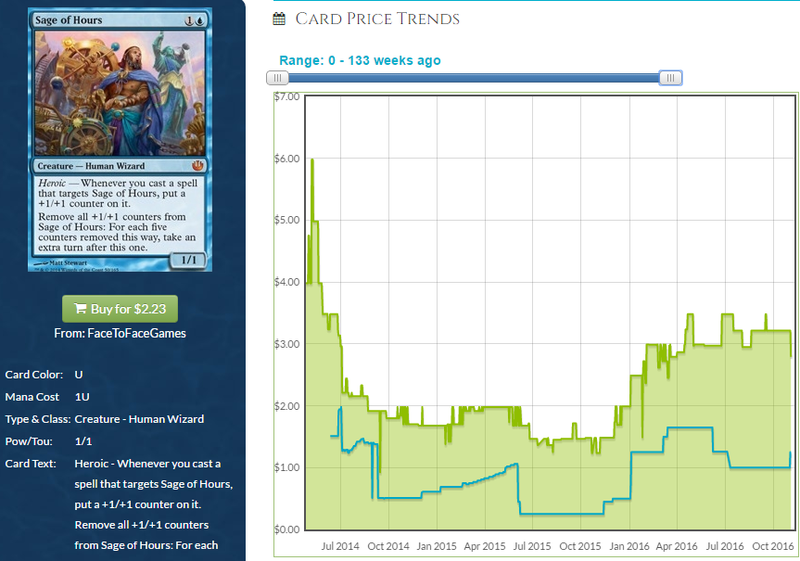 Your LGS’ dollar box getting cleaned out doesn’t alert anyone, but Troll and Toad selling out of copies sure will. Secondly, the Ezuri deck wasn’t that popular. It was plenty popular in the grand scheme of things, but looking back, Ezuri decks with this combo aren’t the number 1 or even number 3 deck archetype to come out of Commander 2015. Meren, Mazirek and Karlov decks are all much more popular. Meanwhile, Atraxa is by far the most popular commander and I predict it will be the best-selling deck. That gives this card, poised for another spike, additional upside. Is Atraxa plus Sage as good as Ezuri plus sage? Obviously not, but the Atraxa deck could end up being better or at least more popular than the Ezuri deck which means you have a lot more people playing Atraxa, especially since people who have an Ezuri deck likely just buy a new copy of sage and leave Ezuri put together. Skate doesn’t exactly make this broken per se, but it does factor into a deck that would play Sage since it’s super unlikely anyone is trying to make Sage get there by playing a bunch of stupid spells that target it. 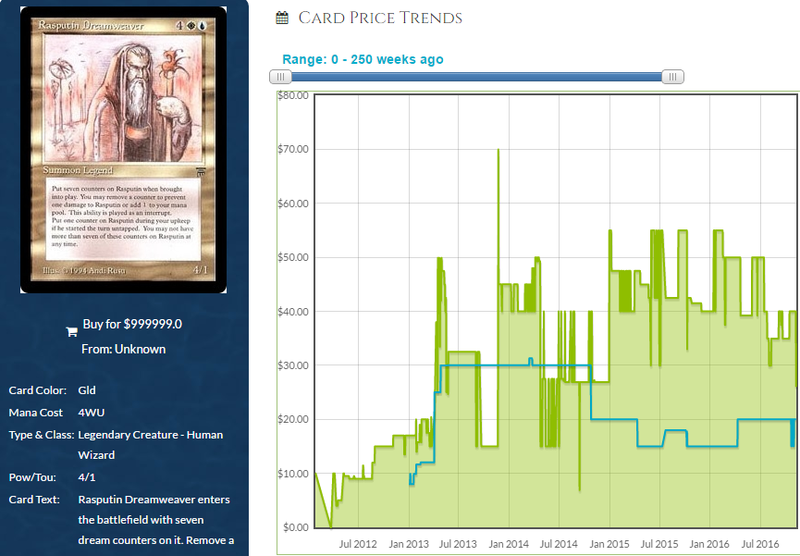 Since it’s a factor in the deck, it goes up along with Skate and Atraxa. This is worth mentioning briefly. 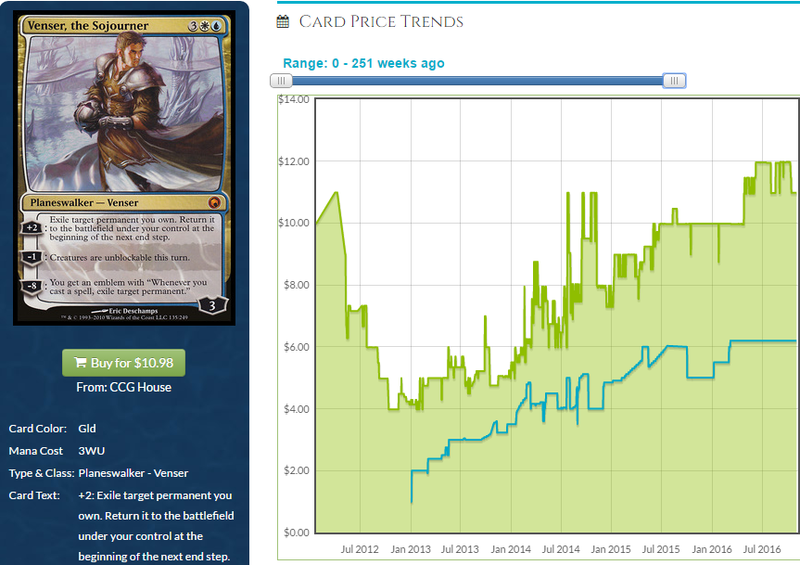 This is currently stable at $2, but Meren has demonstrated that the ceiling is $8. Could this hit $8? No, but that ceiling shows there is room to grow. With Ezuri just as good a commander as ever, its usefulness in new decks built around cards like Deepglow Skate mean it has additional upside and $2 might look like it was a good buy-in point in hindsight. I’m not buying yet, but I’m paying attention. It’s clear we want to pair Deepglow Skate with Planeswalkers, but I can’t think of any others that are as “MUST INCLUDE” as this one. You’re going to get quite an engine going, blinking skate with Venser, and getting to his emblem quicker than normal is going to remind people that this is a stupid planeswalker with a stupid emblem for jerks when you’re nuking their entire board. Blink an Aether Adept to keep rebuying Cloudblazer and watch this emblem start to ruin some lives. A lot of planeswalkers have some upside with Atraxa and Skate running around, but I bet Skate goes in more decks than Atraxa which means, for example, just white-blue decks that can’t run Tamiyo can run Venser and Skate (And Deadeye with Displacer, also) so I think Venser has the most upside. It was a steady gainer already, another reprint doesn’t seem like a high priority and $10 is a steepish but acceptable entry point for a spec. I’m bullish. Remember everything we said about Sage of Hours? It basically also applies for Darksteel Reactor. Second spike, more ubiquity, etc. This is also up from a year ago so clearly Ezuri decks have had some effect and I expect Skate decks to have even more, especially because this could convince players like me who love these kinds of shenanigans to buy another copy that they didn’t need a year ago. This was #1 with a bullet (OK, tied for #1 with a bullet) on our list of “If this card is confirmed not to be in any of the Commander 2016 decks, you buy this because it’s going up” cards. Chromatic Lantern got the reprint, albeit in only one deck (what?) 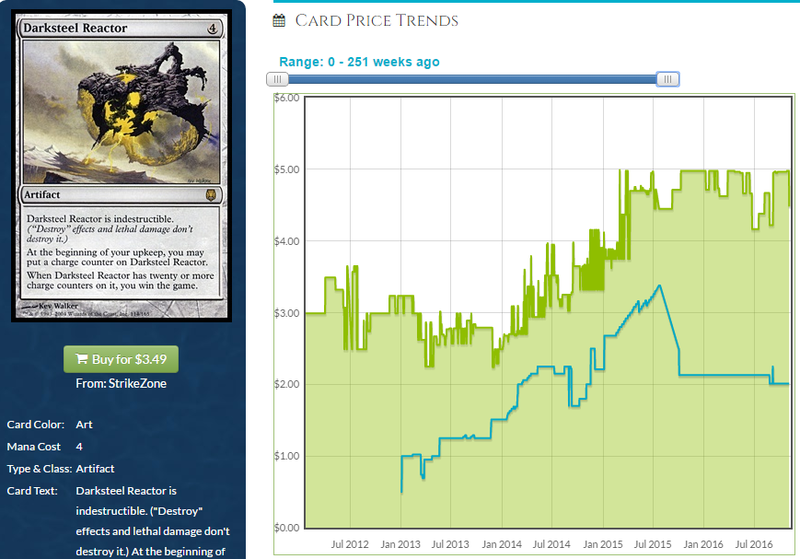 which isn’t odd in and of itself but it does seem odd that Relic wasn’t in another deck. I predicted Lantern would be in 0 or 5 decks and the only scenario I could see Lantern in one deck was where Relic was in another deck, Gilded Lotus was in one, a new card (that turned out to be Prismatic Geoscope, a card much more similar to Gilded Lotus than Lantern or Relic), etc. I knew we’d likely get Commander’s Sphere and Darksteel Ingot but we all still kind of expected some mana fixing at rare and we barely got it. 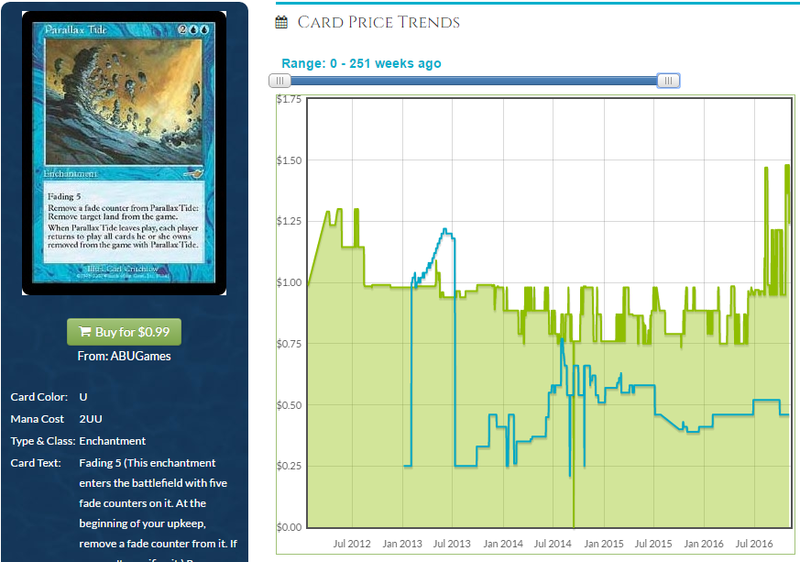 With another prime opportunity to reprint Relic gone, it could be a while before there is even a chance to reprint it let alone an actual reprinting. Add to that the fact that proliferation is very good with Relic and you have a recipe for upside. 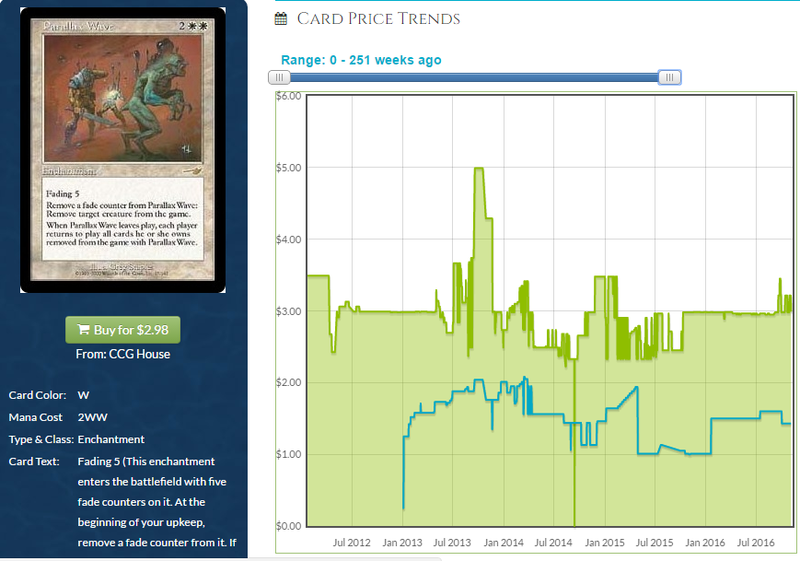 I’m not sure Relic is 100% tied to Skate because of the low degree of interaction (though non-zero) between the two cards but I do think the cards are in the same classification of deck frequently enough for there to be a correlation between the price trajectories even if we can’t establish a causal link. Now’s a great time to move in on this card. Can we all agree it’s going up? Can we agree that its current trajectory is acceptable as far as investments go and that there is a very good chance that line will steepen now that the worry around reprinting has been put off for at least a year and there is likely more demand? Seeing this card and how it interacts with cards like Viral Drake should be enough to get people excited. It’s kind of funny that I usually write about which commanders are going to shove the prices of other cards up, but I think Deepglow Skate is a good enough card to give some commanders another look. Rasputinanigans are more fun in a world with Skate. When they wheeled out Eldrazi Displacer, we expected a bit of a sea change as far as Rasputin was concerned. We didn’t see much of a price increase but we saw an inventory reduction. This is a $30 Legend in a world where Adun Oakenshield hit $50. Now, we all know in hindsight that Adun’s rise was predicated on Tiny Leaders (somehow, not sure what the logic was, honestly) but we also know that price mostly stuck. If this goes up, it’s staying up. There aren’t too many more stores that even have copies of Rasputin in stock and it almost seems like a few people have picked up the deck but no one is really paying attention. Most major retailers are sold out for a higher price than you can get these for on Amazon, but even Amazon has very few copies despite them all being fairly cheap. Skate pairs well-ish with Rasputin and pairs well with the other kinds of cards the deck runs. I don’t want to advocate a buy-out of Rasputin, but if you did buy the relatively small number of loose copies, you probably help this hit $50 and stay above $40, basically forever. Is there more? Yes, obviously. Cards in decks like Roon and Brago have additional upside when you add a card like Deepglow Skate to the blink arsenal. These cards, for example. These both work in decks like Brago very well already. Having the option to keep doubling the number of counters on them and thereby letting you scuttle like 5 permanents every turn if you can keep rebuying Skate is a brutal way to keep them pinned down, especially if you’re using Tide on their land. I think both of these have some upside in a post-Skate universe, but it’s up to people to start brewing with them. It feels like there’s more we could cover because Skate interacts with a ton of cards. I’m sure there is something glaring I am missing, but that’s OK because there will be a period of like three weeks where it will get adopted, show up on EDHREC, prices will move slowly and we’ll still be able to buy in. If I didn’t miss something obvious, great. Even if I did and we can’t make any money of the cards I missed, there’s still plenty here. Deepglow Skate is like Vorel but very easy to repeat by doing things we already want to be doing. We’ll keep an eye on the cards people are beginning to jam alongside Skate and revisit it periodically if there is anything particularly juicy. Chasm Skulker? Panharmonicon? You’ll hear it here, first. In the mean time, there are some excellent targets here and that’s a good enough place to start. Next week we’ll talk about Kydele and some cards that I expect that deck to push up but we’ll have another week of data to look at if there is anything Skate-related we want to go back over. As always, thank you for reading and enjoy MTG Finance on easy mode. I’m sure I’m not the only one thinking this: this series should be protrader. The sheer amount of value imbued into these articles should be more than enough to cover protrader costs. Not quite sure what the criteria is for assigning protrader status to articles, but as a protrader I would like to see Jason’s work as a premium content to this site. This series is behind an artificial paywall called “No one reads it, not even Pro Traders” so you’re in a small, elite group of people who can act on this information. Thanks for reading! Hell, you’re the reason I renewed Jason, paywall or not. I think Travis is great but I’d follow your finance articles anywhere. Thanks for the heads-up on Skate back when. 1, Tap: Put a charge counter on Jeweled Amulet. 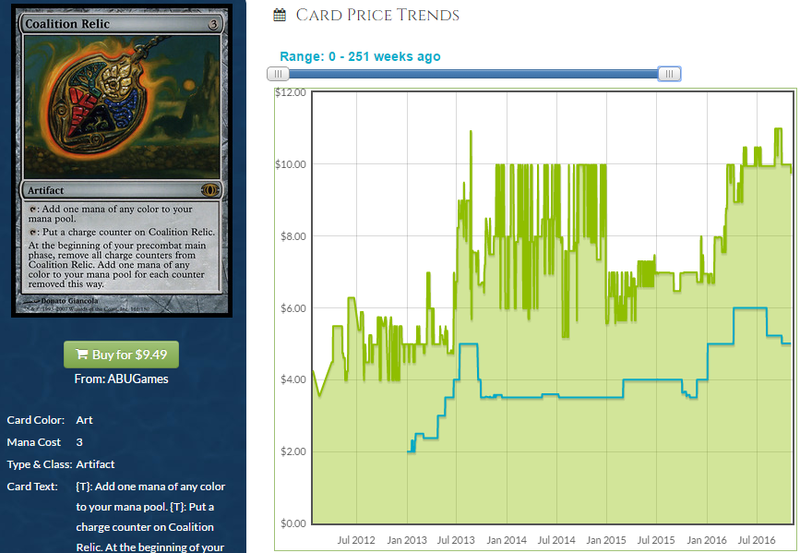 Note the type of mana spent to pay this activation cost. Activate this ability only if there are no charge counters on Jeweled Amulet. Tap, Remove a charge counter from Jeweled Amulet: Add one mana of Jeweled Amulet’s last noted type to your mana pool. Now, if you’re putting charge counters on things or doubling counters on things, this little duder fits right in. It’s not as good as, say, Pentad Prisim or Gemstone Array, since you can’t yank off all the counters at once for mad profits, no. But, if your deck is the kind of deck that can reliably keep adding counters to Amulet incidentally, it should have a home. A 1cc mana rock that makes mana of any color you fed into it initially is very, very good. Even without shenanigans, being able to ramp from 2 to 4 mana (which is what this does) is quite good. Good though it is, it’s minor, and I would not even bring it up except that it’s from Ice Age and there ain’t many out there. That’s a card I used to play with back in the day and even I forget. Nice pick! I agree that Ice Age cards are rare enough that there are fewer Ice Age Uncommons than Kaladesh rares.